Since 1947, Stanley Steemer has been offering residential and commercial carpet cleaning services. Now extending cleaning services to upholstery, hardwood and more, the company has over 300 locations in 48 states. With over 3,000 familiar yellow vans across the country plus additional rolling assets and equipment, fleet management is a huge part of Stanley Steemer’s core business operations. A single out-of-service vehicle could cost the company thousands of dollars over just a few days, so it is clear that uptime is vital to Stanley Steemer’s quality service commitment. Historically, each Stanley Steemer branch had a team of three to four technicians who conducted vehicle inspections. Using paper forms, the team went through inspection checklists for each vehicle. Since each branch had anywhere from eight to 40 vehicles, performing vehicle inspections took a substantial amount of time. The technicians, whose main job function is to clean carpet, took time out of their day to perform vehicle inspections. Technicians then had to enter inspection data into Stanley Steemer’s proprietary software. "It was easy to get pencil whipped." 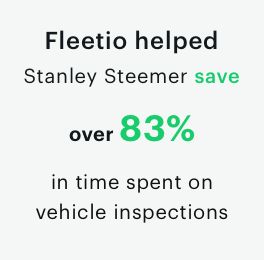 Already a Fleetio customer for years, Stanley Steemer was one of the first to onboard Fleetio Inspections when it was released in 2016. Through a 60-day pilot program, the company began migrating from a paper-based inspection process to using Fleetio Inspections via mobile devices. After using Fleetio Inspections at select locations during its pilot program, Stanley Steemer has now implemented Fleetio Inspections at 65 branches across the country. Stanley Steemer technicians now complete comprehensive weekly inspection checklists using Fleetio. Where performing and inputting data for multiple vehicle inspections previously took technicians over an hour, Stanley Steemer techs now spend about 10 minutes per vehicle inspection and no longer spend time on manual data entry. With an overwhelmingly positive response from the entire Stanley Steemer team, technicians appreciate how quickly inspections can be performed. Using Fleetio’s customizable inspection tools, Stanley Steemer management creates and replicates inspection forms based on specific compliance, vehicle and equipment requirements. “Being able to customize vehicle inspections forms has been a very simple process,” said Steve Curtin, National Fleet Supervisor at Stanley Steemer. “We’re currently building inspection checklists for some of our more expensive equipment which requires specific inspection criteria and instructions for techs." All Stanley Steemer team members utilize tablets that include Fleetio Go and Stanley Steemer’s proprietary software, so everything from vehicle inspections to repair work to customer information is accessible all in one place. This has helped the company streamline all of its business operations in addition to just fleet management and inspections. Learn more about Fleetio Inspections here!